Overnight falls of 3.2% for the DOW (3.30% for S&P, 4.40% NASDAQ) are reminiscent of January-February 2018, and just like then it feels very unpleasant. However as always perspective is required when trying to ascertain whether this is a transitionary correction or the start of something more sinister. After a strong August reporting season rising bond yield together with, global trade tensions, strengthening USD and rising energy prices have been placing pressure various markets, both developed and emerging. In response, most global equity markets including the ASX have given up their gains for the year with only a couple of months remaining in the calendar year. Longer-term rates have been rising from months, but equities, by and large, have held up despite that. Smaller stocks had been impacted in recent weeks with gains getting narrower across the market only concentrated across a handful names. Until yesterday the 150 largest companies in the S&P 500 were up 0.08% for October, whilst the smallest 150 stocks are down 3.74%. The 3rd quarter in the US was the best in 5 years, with some of the lowest volatility since the 1960’s. 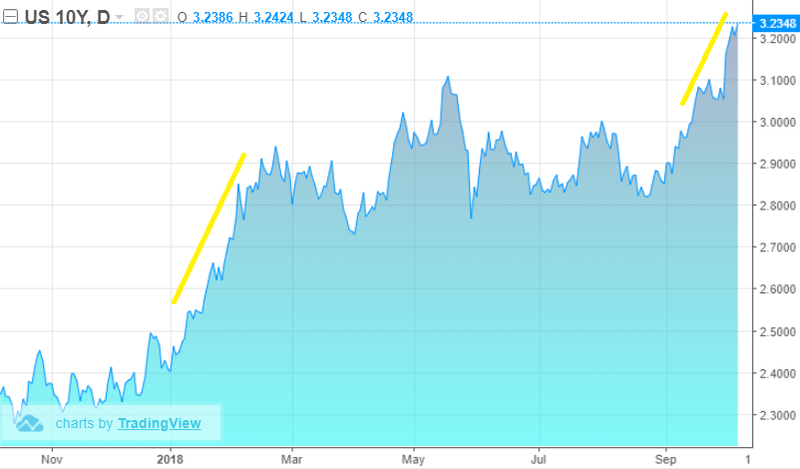 In just a few days US markets have 'turned on a sixpence' delivering the longest losing streak since Nov 2016 with the selling flowing onto the larger areas of the market, such as the FANNGs. The falls come amid no real new catalyst for the markets. Although valuations look more appealing than a year ago it’s the same concerns around bond yields and trade tensions weighing on markets. At first glance, there appear to be similarities to the January-February selloff when we had a similar spike in yields leading to a sharp decline in equities. When yields rise sharply as they have, investors essentially reassess how much risk they want to take, reducing exposure to perceived riskier sectors such as Technology in favour of more defensive names. We feel the market is in a ‘feeling- out’ period trying to determine whether it’s comfortable with higher yields as a reflection of a strong and robust economy? Or whether higher yields are a sell signal because you must discount earnings at higher discount prices? As always perspective is important in these instances. In the context of long-term returns markets have only given up a very small amount with US Shares 4% down and not far from record highs. Is important in times like these to remember that companies don’t change much, but prices can change a lot. My belief is that investors in the main are better off in the long run spending ‘time in the market’ as opposed to trying to time the market perfectly by jumping in and out of shares completely. Often investors feel an urge to ‘do something’ in times of turbulence. But we feel the best thing to do at times is to do nothing. These kind of pullbacks in markets are normal sometimes lasting for only a couple months, other times longer. But we think its worth remembering that not every sizable pullback preludes a crisis. The average pullback has lasted 42 days and fallen -9.3%, while the Median 26 days and fallen -8.4%. The point of outlining these figures is to highlight those periods of volatility like we’ve experienced in recent months may be unpleasant but certainly aren’t uncommon in the history of equity markets. The 5-year chart of the ASX below highlights similar pullbacks we’ve experienced in recent years. On each occasion the market has recovered within months. There’s no guarantee that will occur this time around however given the correction appears to be more about a market re-rating in the face of higher bond yields, rather than a contraction in company earnings or a persistent global economic slowdown, Medallion remains sanguine about the medium-term outlook. The inverse relationship between bond yields and company valuations have again being drawn to the forefront of the minds of market participants. Investors should understand as bond yields rise, asset prices fall and sometimes by a disproportionate amount depending on a company’s anticipated growth profile. However, as mentioned in a Livewire article earlier his year, all else remaining equal, if company earnings are growing fast enough to offset the negative effects of rising rates, then a company’s valuation shouldn’t be necessarily be affected. For instance, if the growth in company profits (which is good for equities) is faster than the rise in interest rates (which is negative for asset prices) than the negative impact of rates is negated. As it stands liquidity is ample, commodities stable and volatility remains relaitivly low. This also gives us confidence that the falls can in time be contained after a healthy shake out. Looking more short term however and the next moves from here are anyone's guess. Given the severity of the daily falls and the fact that the markets finished on their low, the selling pressure may well continue for some time to come. A good note Michael. Company profits and economic activity, which are obviously linked, are critical to equity values, but what's your view on the withdrawal of QE in the US and EU? This seems to be another, probably larger, issue that global assets will face in the short to medium term. Thanks for the question Simon. I tend to agree with you that the withdrawal of QE is another headwind for markets. QE has widely been credited as having been a significant driver of asset price returns. Therefore, one can expect the withdrawal of QE to have an adverse impact on asset prices. Exactly how that plays out is difficult to predict however we would expect it to show up in fixed income markets. Naturally with central banks pulling back, or out, of many markets there will now be less demand for certain parts of the yield curve. This will likely contribute to the upward pressures we are already seeing in yields. In the end of the day it’s not one factor alone the causes asset prices to fluctuate, rather a series of things. Some of these factors will have a positive impact on prices (Earnings growth), others will have a negative impact (Withdrawal of QE). It’s the net result of these factors (i.e. positives outweigh negatives or Vice versa), that will determine whether the move is positive or negative. I see no reason for a crash as the market is just doing it's thing! in fact the chart shows it is down now and should be turning up soon as it reaches the resistance point. Volatility is opportunity if only one had more cash and nerve to push the button.